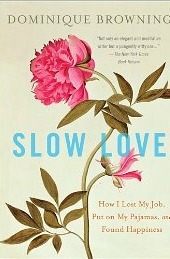 For my first BlogHer book review, I received Slow Love: How I Lost My Job, Put on My Pajamas and Found Happiness. The title excited me as I have recently lost my job, I love pajamas and I want to be happy. When the book finally arrived at my house, I loved the unevenly cut pages, the textured paper, the embossed cover. I settled in for a good read. Unfortunately, the author, Dominique Browning, takes a long time to muddle through her past mistakes and relationships to find contentment. There are times when she is talking about selling her house or planting mint that she circles around into so many flashbacks that you are uncertain of what subject she was talking about when she first started. As a typical workaholic, Browning has a difficult time defining herself without a job. She no longer feels validated as a member of society and takes to only venturing out of her house on Saturdays when she knows that no one else is at work. In this addict without an addiction state, she attempts to fill herself with baked goods, placing the focus off of her own crazy onto her on again, off again lover so that we are never really able to delve deeply into her funk. I expected the book to be a coming of age/self-help journey, what I got instead was an autobiography of any one of the people that have been laid off since 2007. I already know that story. This was a paid review for the BlogHer Book Club. If you would like to join the discussion, see additional reviews or read an excerpt of the book, you can join us at the Slow Love page.